How might your world be different if you were so tuned into source, to the highest truth, that you were living in an easy flow? Living a guided life? Imagine how much better life could be if you discerned YOUR unique form of connection with Higher Self, or what we call inner guidance, so well that you could access it, know it and act on it all the time. This empowering DVD series not only gives you this, but much more. Learn to identify the everyday obstacles which can block the path of guidance and, perhaps more importantly, learn how to shift or avoid them. You will be empowered with effective tools to alter, clear and shift anything that prevents you from living life to the fullest and even to full self – actualization. In addition, these DVD’s are filled with engaging teachings, wisdom & practical exercises with real take home value that will transform your reality in various areas of life. A life of guidance creates incredible shifts in material wealth, health, abundance of all good things, romantic and other relationships, livelihood, prosperity, easy living, and connection to spirit. When you are in the“right” place, at the “right” time, doing the “right” thing, anything and everything becomes a possibility. Imagine what could be if you were living this way? The video you will see in these DVD’s is a sampling of the absolute best of several weekend classes Magick taught on Inner Guidance in the last few years. The series includes the complete Guidance for Life™ approach and are jam packed with enlightening stories as well as illuminating examples. The stories and examples make the information super easy to assimilate and comprehend. Further, to make the effect even more potent, entertaining and interactive experience, the DVDs are packed with video overlays from incredibly beautiful places such as the Hawaiian Islands, Mount Shasta, power sites and other illustrative video footage. There is a transmission of powerful energy to the viewer that takes place because some of the footage is from sacred site vortexes. 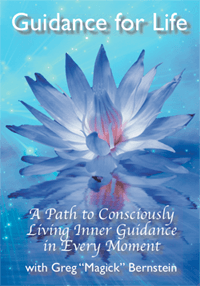 Guidance for Life™ DVD’s are now offered with a significant discount. Further, for a very narrow time frame, only in the current production, the Violet Fire Clearing meditation is on the DVD’S. So if you choose to Buy the DVDs, you have both! Most people desire the Violet Fire Meditation additionally in a CD format so that they can listen in more varied environments (such as your car). So we have priced it inexpensively. Its up to you, choose just the DVD’s or get both.